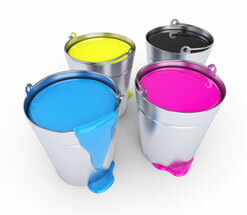 Paint your home in colors to reflect your life style. Art or artistic wall painting is a completely new approach to interior decoration. You can order any type of picture or image painted directly on the wall in your living room or bedroom. Stick with neutral colors on walls to create a spacious feeling and give the illusion that walls are farther away than they really are. Create an airy sense of space with white paint or white accessories that reflect light. Reflect light and make the room seem larger with light, glossy tiles and floors. Enlarge the look of a room with soft shades of yellow paint or small wallpaper prints in soft colors. Use pastel colors to create a light, airy feeling in narrow hallways, tiny bathrooms and small bedrooms. Make the ceiling seem higher by using wallpaper with narrow stripes of soft pastel colors and white. Choose furniture and moldings with light-colored woods for soft effects.